All of us have favorites, a song, a color, a book, a restaurant. But what about poems? Which poems have stayed with you over the years, which poems do you come back to and read and reread? Which poems make you think, move you to tears, or make you feel alive? Former Houston Poet Laureate Robin Davidson took on these questions and the power that poetry can play in our lives when she initiated Houston’s Favorite Poems, now an anthology. Tonight, Thursday, January 18, 6 pm at the Julia Ideson Building, Houstonians will come together to celebrate the launch for the anthology. Click here for more information and join the celebration. Earlier this week we caught up with Robin to talk about the project and the process of putting the anthology. INPRINT: What inspired this project? ROBIN DAVIDSON: Robert Pinsky first came to Houston in the early eighties to stand in for then poetry editor of The New Yorker magazine, Howard Moss, who was teaching a poetry workshop in the University of Houston’s Creative Writing Program. I was a graduate student in that class. When Mr. Moss became ill, Pinsky stepped in as our teacher, and one assignment that was life-changing for me was the personal favorite poem anthology he asked each of us to develop. We were to choose at least ten of our favorite poems and write them out, feeling the line breaks in our hands as we wrote or typed and allowing the poems to become our own for a moment. The poems could come from any poet, language, or century, including from among our classmates’ work—what a thrilling exercise it was! I’ve kept my anthology to this day, adding to it over time, and have, for many years, asked my own students to keep such an anthology that includes a preface discussing why each poem is meaningful to them. The results are always lovely—moving and beautiful—and the poem choices are often surprising. The community project I proposed as part of my application for the role of city poet laureate was a city-wide anthology of favorite poems chosen by Houstonians similar to the kind I’ve kept on my own now for more than 30 years. The very spring that Mayor Annise Parker appointed me to serve as Houston’s second Poet Laureate. Fran Sanders, founder and executive director of Public Poetry, had a vision for bringing the Favorite Poem Project to our city. She invited former U.S. Poet Laureate Robert Pinsky, founder of the national Favorite Poem Project in 1997, to Houston to launch the project. Houston’s Favorite Poems first began as a reading of beloved poems by Robert Pinsky, Mayor Parker, Dr. Rhea Lawson, Director of the Houston Public Library, and a number of other distinguished Houstonians at the Julia Ideson Building on September 9, 2015. It’s fitting that it should come to completion this week—Thursday, January 18—as a book launch and reading at the Julia Ideson. INPRINT: What was the process of putting the book together? How many submissions were received and were all of them included into the book? 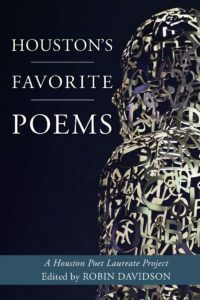 ROBIN: The project is modeled on Pinsky’s national anthology, Americans’ Favorite Poems—an initiative dedicated to celebrating, documenting, and encouraging poetry’s role in Americans’ lives (http://www.favoritepoem.org/). In spring 2016, the Houston project—with the support of Mayor Sylvester Turner’s office—made a call for favorite poems to those living in Greater Houston, a nine-county metropolitan area. I invited a team of Houston poets of diverse aesthetic styles and cultural backgrounds to work as an editorial team in choosing poems for inclusion. My deep thanks go to those poets—Sara Cooper, Billie Duncan, Rich Levy, Guadalupe Méndez Medina, Jasminne Méndez, Deborah D.E.E.P. Mouton (Houston’s third Poet Laureate), Martha Serpas, Melissa Studdard, and Chris Wise. We received approximately 400 poems in response to that call, and each poem entry was reviewed by the poet team who carefully considered submissions. We selected approximately 200 poems to be included and then began the onerous process of determining which of the accepted poems were in the public domain and which we would need to secure permissions for. Only about 60 of those poems accepted were in the public domain and available for inclusion at no cost. The remaining 130-140 poems waited in limbo for some time until rights to the poems could be acquired, licensing agreements signed, and permissions fees paid. Regrettably, we were not able to afford all poems we’d hoped to print. There were several poems that Houstonians chose that I had so hoped to include, but the fees were too costly for the project. We have been able to include 185 poems in the volume just published by Calypso Editions, a nonprofit independent literary press housed at the University of Houston-Downtown. My deep thanks go to those poets—Sara Cooper, Billie Duncan, Rich Levy, Guadalupe Méndez Medina, Jasminne Méndez, Deborah D.E.E.P. Mouton (Houston’s third Poet Laureate), Martha Serpas, Melissa Studdard, and Chris Wise. 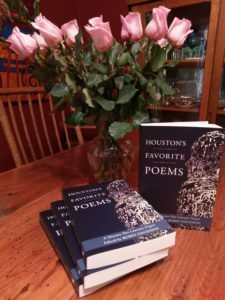 Of the more than 200 Houstonians whose favorite poems appear in Houston’s Favorite Poems, as you might expect, many are teachers, students, writers, editors, and librarians. However, what we discovered in our review of submissions was that poems are also deeply meaningful in the lives of many Houstonians not trained or employed in the literary arts. You’ll find favorite poems submitted by those in occupations as diverse as an engineer, a cattle rancher, a wood worker, or clergy, CPAs, electricians, scientists, many in various health professions, as well as musicians, visual artists, and arts administrators. These contributors, ranging in age from 18 to 87, live throughout Greater Houston, and represent more than 100 zip codes. You’ll find favorite poems submitted by those in occupations as diverse as an engineer, a cattle rancher, a wood worker, or clergy, CPAs, electricians, scientists, many in various health professions, as well as musicians, visual artists, and arts administrators. The anthology includes 120 poets from across the globe whose work appears in alphabetical order by poet surname. Many poets from the United States are represented, ranging in ethnic background from such African American poets as Maya Angelou, Lucille Clifton, Nikky Finney, Langston Hughes, and A. Van Jordan to Asian American poets Amanda Huynh and Claire Kageyama-Ramakrishnan, Mexican American poet Juan Felipe Herrera, Native American poet Joy Harjo, and Sudanese American poet Safia Elhillo. But Houstonians have also been moved by poems from other national and cultural origins, many of which were composed in languages other than English and appear here in English translation—Canada, Chile, China, Czech Republic, Greece, El Salvador, England, Germany, Iran, Ireland, Israel, Japan, Mexico, New Zealand, Palestine, ancient Persia, Poland, Puerto Rico, Russia, Scotland, Somalia, and Wales. We have chosen to include two special sections in this volume. The first celebrates the work of Houston youth studying in the Writers in the Schools (WITS) program and appears in the book’s center, with some poems rendered graphically by University of Houston-Downtown graphic design students. We are grateful to Robin Reagler, Jack McBride, and all at WITS for the opportunity to publish poems by Houston youth—including those by Houston’s two Youth Poet Laureates, Andrew White and Fareena Arefeen. The second of these sections concludes the book as a memorial tribute to Houston poet, Claire Kageyama-Ramakrishnan (1969-2016), who was a member of the selection committee nominating me as Poet Laureate for Mayor Parker’s consideration and who was also an early participant in the poet team designing the anthology. Claire’s husband, Dr. Rajesh Ramakrishnan, stepped in on her behalf in the crafting of the book, and I am enormously grateful to Raj for his strength and dedication. It’s also important to note that this book would never have come to fruition without the generosity of hundreds of poets, translators, publishers, permissions professionals, and many Houstonians, including: Mayor Turner and his staff in the Mayor’s Office of Cultural Affairs, Radu Barbuceanu and Debbie McNulty; Dr. Rhea Lawson and her Library staff, Jennifer Schwartz and Carmen Abrego; Dr. Michelle Moosally and the faculty of the Department of English at University of Houston-Downtown (and a former student of Houston poet Lorenzo Thomas and dear friend of the English Department who wishes to remain anonymous); Christine West and Houston First Corporation; and a number of my beloved students who worked on the permissions process—especially Joshua Johnson and Jon Adams. I also want to offer a shout out to Tony Bonds, a novelist and the graphic designer for Calypso Editions! This man is enormously talented, and patient beyond all belief. Another such talented, patient guy is my dear husband, Tony Davidson, whose lovely photograph of one of Jaume Plensa’s Tolerance statues appears on the book’s cover. I’m indebted to hundreds of terrific people for their collaborative collaboration and hard work, including you great people at Inprint! INPRINT: Can you share your favorite poem with us? As I watched my husband rebuild our own small losses, or in the George R. Brown Convention Center shelter where I witnessed the grief, the intermittent humor and hope, of those who’d lost everything—Ed’s words, committed to memory years ago, were those I’ve repeated in my mind’s ear for solace. I hope that this amazing collection of poems held dear by so many Houstonians will serve as a testament to and celebration of the vibrant presence of poetry in our great city—and will offer its readers, as Ed’s work so often offers me, the experience of poems as beloved human voices, companion spirits, at our sides when we need them, leading us into light. I hope that this amazing collection of poems held dear by so many Houstonians will serve as a testament to and celebration of the vibrant presence of poetry in our great city—and will offer its readers, as Ed’s work so often offers me, the experience of poems as beloved human voices, companion spirits, at our sides when we need them, leading us into light. A big thanks to Robin Davidson for taking the time to chat with us about the project. For more information about tonight’s celebration click here. The Inprint Staff is a bit nerdy, a bit quirky. They read too much, don't sleep enough, and love dark chocolate. But seriously, they are an all around great group of people. The staff include Executive Director Rich Levy, Associate Director Marilyn Jones, Development Director Ann Shaw, Communications & Community Relations Director Krupa Parikh, and Program & Office Manager Patricia Ayala. If you come to Inprint events, you'll see them in action.